The object is available for viewing at Iziko’s Social History Centre by appointment only. Attic black and red figure vessels were made in a potters’ workshops in the Ancient Greek Empire, using a potter’s wheel that was operated by labourers and slaves. The tools of the potter were primarily his nimble fingers, aided by a few simple implements, and through the complex processes of wedging, throwing, turning and joining, which are still used by modern ceramists, these vessels were brought into being. The imagery painted on the vessels depicts tales of past civilizations and Greek iconography and culture. The meticulous craftsmanship that was involved in creating these vessels is nearly impossible to recreate, and as a result Greek vases carried [and still carry] high artistic and commercial value. The production workshops were located in Kerameikos, in Athens, and were close to the Mediterranean and Black seas, which were common thoroughfares for ships carrying goods for trade from the Empire. This proved to be convenient for the sale of the pottery, largely to the Mediterranean region and further lands. This hydria, like most others, was made by slaves in a potter’s wheel using attic clay found in Kerameikos in Athens. How it came to be part of a collection in England is unknown, but it may have been traded, purchased by a museum or purchased by an auction house, where these vessels fetch millions of dollars as rare objects. WHAT CAN A GREEK VASE TELL US ABOUT SOUTH AFRICAN MUSEUM HERITAGE? The red-figured hydria is an ancient Greek vase dating to the 3rd and 4th centuries B.C. The hydria is a liquid storage vessel used for products such as oil, perfumes, wine and water. Its simple design, an oval centre, connected to the top by a flat shoulder, three handles: two horizontal, one for the handling and one which facilitated the pouring, made it a popular design during the peak of its trade and production. Between 1820 and the early 1900s, South African museums mostly represented white dominance. Under the apartheid regime, between the 1950s and the 1990s, state museums were co-opted into nationalist ideology by the National Party government. During both these periods, Greek vases were collected by museums, because this is what European museums collected. Since the 1994 democratic elections, South African museums opened their doors to all, and under the new government are required to illustrate a multicultural, rainbow nation and redress our nation’s discriminatory past. The museum’s lens shifts from insular and repressive to re-imaging, and this has inevitably led to extensive re-thinking and reordering hierarchies within the museums throughout the country. The red-hydria was once a dynamic object used for its practical purposes and to display the power and beauty of the Greek empire. But overtime, it has become static and an object of desire, moved from private ownership to a public heritage and cultural institution. It’s movement from one continent to another speaks to global trade and the value of these highly priced objects. 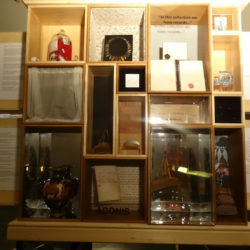 The museum’s role in acquiring the hydria is significant as it performs its original function as a cabinet of curiosity. Yes, we can learn a lot from the Greek vessel, both in terms of its original context and its movements across the globe, but as we move towards a contemporary postcolonial museum, we need to consider what these kinds of objects, like the red-hydria Greek vase, can say about South African heritage, and how we value its various aspects today. When South African museums were under White colonial, and subsequently, apartheid control, their primary mandate for identifying items to collect, catalogue and curate was very much based on a Eurocentric model of collecting. As a result, they have objects such as the red hydria in their collections; objects which do not speak to the South African context or to the majority of the population. While this was not a problem for White colonialists and apartheid officials, it has become a concern to the democratic dispensation, which seeks to reimagine, and in turn rethink and reorder, museums and their pervasive hierarchies. The red-figured hydria was bequeathed to the South African Museum (SAM) in 1930 by Alfred de Pass, who is described by South African art historian Anna Tietze (1995) ‘as one of the most lavish art benefactors of the century’. 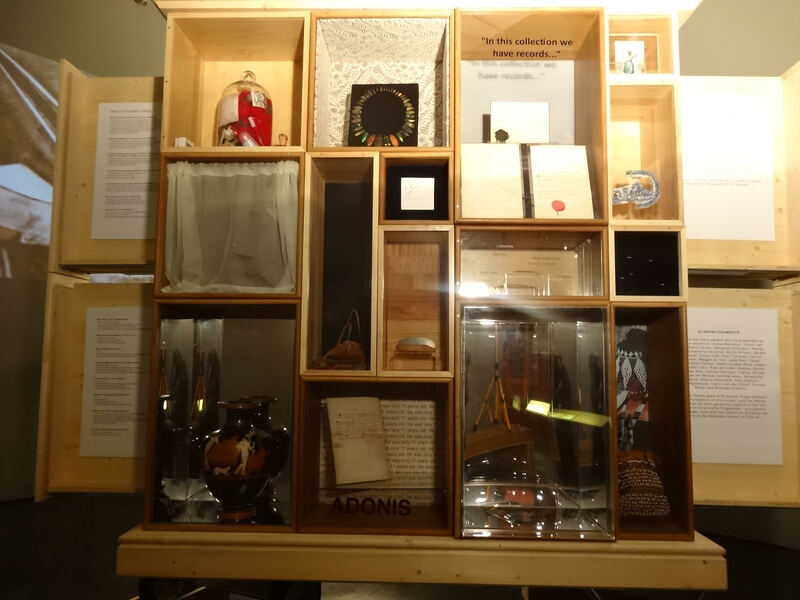 The displaced vessel is now conserved in the Iziko Social History Centre’s (ISHC) Greek collection under the supervision of Esther Esmyol, the curator of Social History, and is catalogued with the accession number SACHM 1327. It has a height of 37 cm, and its widest diameter is 31 cm. The maker of this Greek vase is unknown, but the object nonetheless has a story to tell, namely: how it was made, when, by whom, for what purpose, and what its relevance is to South Africa. 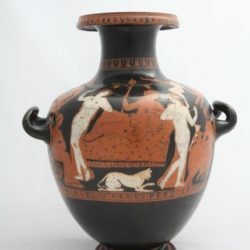 This ancient Greek vase dates back to the 3rd or 4th centuries B.C., when it would have been used as a liquid storage vessel for products such as oil, perfume, wine and water. It has a simple design, with an oval centre connected to the top by a flat shoulder, three handles: two horizontal, one for handling carrying, and one that facilitated pouring. This made it a popular design during the peak of its trade and production (3rd to 6th centuries B.C.). This hydria, like most others, was made by slaves on a potter’s wheel, using attic clay from Kerameikos in Athens, conveniently locatedclose to shore. The Mediterranean and Black Seas were common thoroughfares for ships carrying hydrias and other goods for trade from the ancient Greek empire. the history of the South African antiques collections and their reception is not a simple story of a former colony inheriting these dusty tokens of an Empire’s wealth and glory. Nor is there a straightforward or trouble-free account of their current meaning in a post-colonial, post-apartheid context. Many museums across the globe have ancient Greek vases in their collections. In auction houses, rare Greek vases can fetch millions of dollars, apparently because of their artistic and commercial value, and the meticulous craftsmanship that is centuries old and impossible to replicate. The imagery painted on the vessels is important, as it depicts tales of past civilisations, Greek iconography and culture. These objects, which were once functional, now live in the false light of display boxes and the shadows of storage rooms. From 1926 until 1949, de Pass generously donated several works to museums and galleries. The hydria was taken from de Pass’s private collection in Falmouth, England, and was bequeathed to the South African National Gallery (SANG). The largest influx of classical objects into the collection was through his donations, between 1925 and 1942. 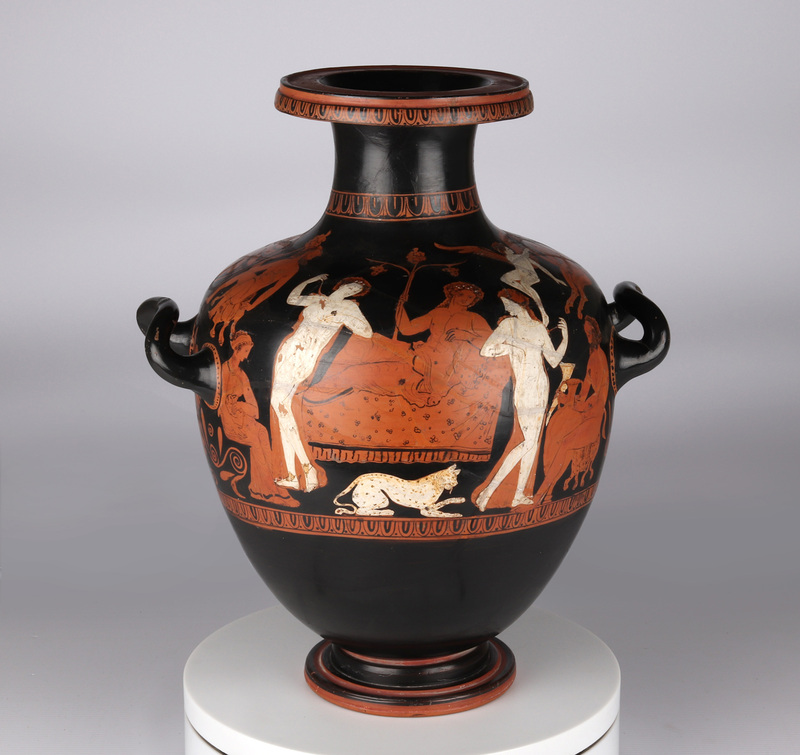 The red hydria was first publicly exhibited in 1934 as part of The de Pass Collection: Objects Illustrating the Arts of Ancient Civilisations. In the 1960s, this vessel was moved to the newly established South African Cultural History Museum (SACHM), where it was photographed, catalogued and displayed. In the early 1990s the country ushered in political change, and the hydria landed up in storage at the National Mutual Building, date unknown, when the SACHM galleries were rearranged. The ISHC catalogue card has very little information about the various venues in which this hydria has been displayed. However, we do know that it went out on loan to the Sasol Art Gallery in Stellenbosch (currently the Stellenbosch University Museum) as part of a show titled Living Antiquity (2005–2007) and then formed part of a smaller exhibition, Containing Antiquity (2007–2011). According to Esmyol, the hydria now functions mostly as an object to be studied and exhibited by university scholars. 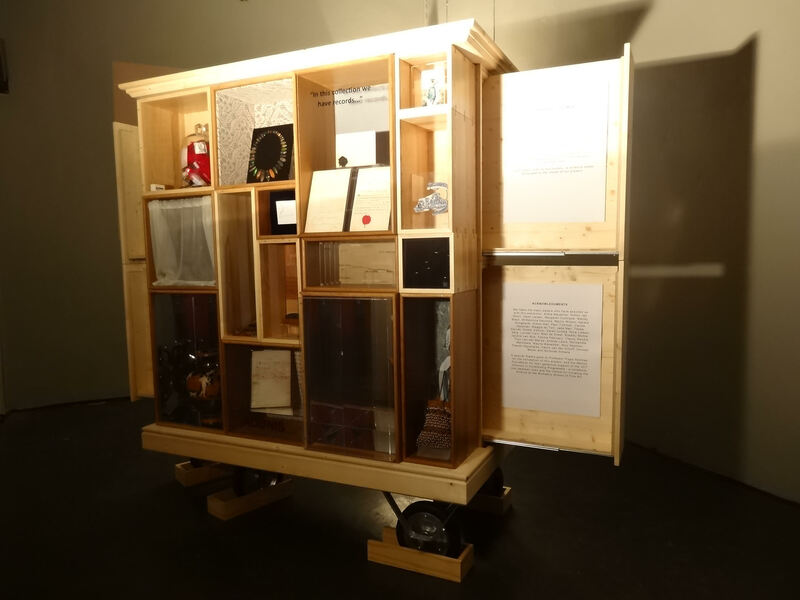 The red hydria is on exhibition at the Center for Curating the Archive’s Object Ecologies exhibition, which opened in November 2018, at ISAM. 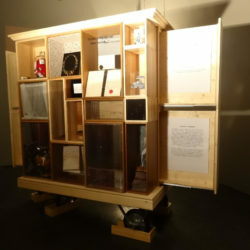 All the displayed objects are exhibited in wooden cabinets. The inclusion of this hydria, with other objects bought, stolen and found as a result of colonial rule and apartheid, is important, as it tells us about the interrelationship between the varied static objects on display, all tasked with speaking to our heritage. These objects all come from various national museum collections, each with a distinct collection history and objective. 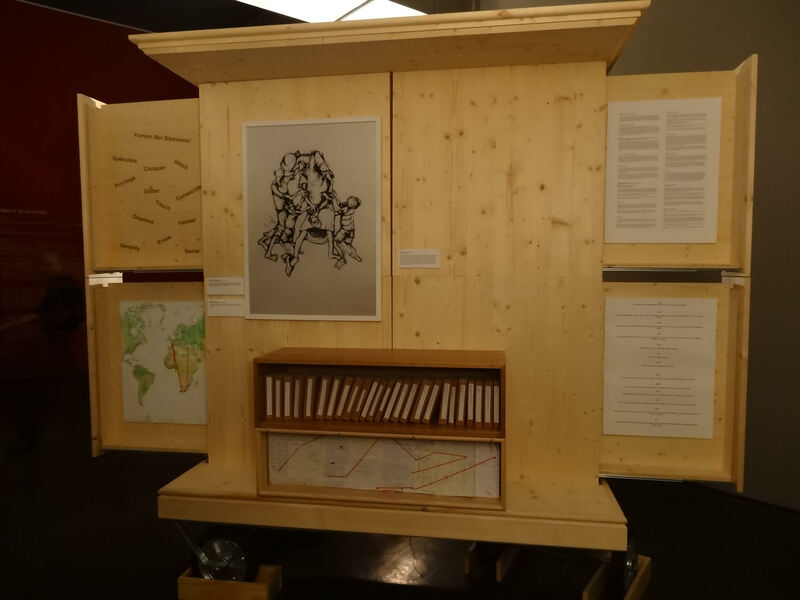 The cabinet’s display can be read as a microcosm of Iziko Museums of South Africa, of static objects functioning as a tool of reimagination of our nation’s past, and a gateway to understanding the contemporary. The civilisation of ancient Greece is one of the earliest and biggest colonial empires. By the 5th century B.C., the Greeks had colonised the Mediterranean, the Black Sea and beyond and established regional governance known as polis (city). Each polis was governed by a constitution, currency, dialect and laws. Greek language, literature, history, cultural costumes, norms and beliefs spread to Rome and lands as far away as North Africa, the former Ottoman Empire and the Middle East. Most poleis adopted Greek culture as a central feature of education, culture and governance, and the various poleis fought amongst each other for dominance. By the late 8th century B.C., Roman conquerors colonised and annexed Greece and its poleis but kept many of the Greek ways of life. This Gallery was built … to house my pictures together with the pictures then housed in a backroom at the Museum … and I was allotted three rooms for pictures, watercolours, and drawings, etchings and engravings … etc … I was allowed to hang the pictures and have done so on and off up to the time of your arrival. By 1949, de Pass had bequeathed the museum over two hundred and forty paintings, relics, drawings, prints and sculptural works, including this red hydria. Cultural imperialism in the fields of sociology, art history, curating and anthropology, amongst others, prioritised Eurocentric cultural relics, artworks, customs, languages, norms, values, ethics and beliefs. Colonial and apartheid South Africa’s museum collection practices perpetuated this by privileging Eurocentric objects, which culturally instrumentalised colonisation through a belief in the superiority of European relics and, by extension, history. This supported and fuelled colonial and apartheid social, cultural and political dominance. The privileging and collecting of objects like this red hydria functioned as a political tool to prevent the intrusion of ‘uncivilised’ norms, customs and beliefs. The museum further mitigated resistance by the colonised by cataloguing incorrectly and deliberately eradicating objects that did not support colonialism (and, subsequently, apartheid). In post-colonial, post-apartheid South Africa, cultural imperialism is slowly ending. The museum’s lens has shifted from insular and repressive to a lens that seeks to reimagine. This has inevitably led to an extensive rethinking and reordering of hierarchies within museums throughout the country. So how is this vessel relevant to a South African museum-goer? In the nation’s reimaging approach to the archive and collections, what can these objects say about contemporary South Africa? With these questions in mind, I recently visited the exhibition Fired at the Castle of Good Hope, curated by Esther Esmyol. Although the exhibition outlines ceramics’ and pottery’s global design influence across cultures and time, the focus covers material culture and status to practical and cultural function and adds to a narrative of displaced, static objects. 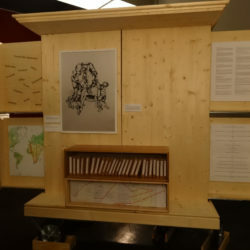 Objects in Wunderkammers (cabinets of curiosity) are permanently displaced; the challenge for curators, particularly in South Africa, is to problematise and rethink the objects through a postcolonial lens, placing equal importance on the objects’ history, makers, original function and its state of limbo in the museum space. As we move towards a contemporary postcolonial museum, we need to consider what such objects can tell us about South African heritage, and how we value its various aspects today. 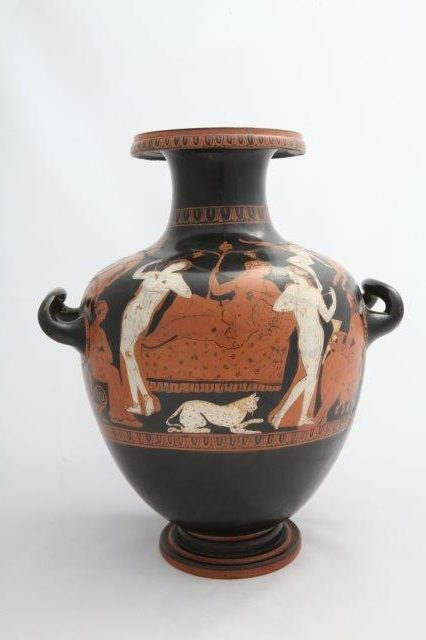 Although they are not connected to the cultural life of the majority of people in the country, objects like the red hydria tell us not only about the power and beauty of the Greek empire, but also about the Eurocentric collecting practices of South African museums and the international valuations that influence what we value and, in turn, collect and conserve through our museums. The question of what it can tell us about South African heritage remains to be seen. In the same fashion as museum collection practices, this essay itself perpetuates a familiar privileging of knowledge discourse – reproducing debate around the same objects, but through the lens of reimaging, restricting and reimagining, shifting the center from classics to popular contemporary discourse, as a means to justify the continual preservation, privileging and conservation of the same old relics. Boardman, J. and M. Pope. 1961. Greek Vases in Cape Town: Guide no. 6. Cape Town: The South African Museum. Dugas, C. 1926. Greek Pottery. Translated by W. A. Thorpe. London: A. & C. Black. Gill, E. L. 1934. Catalogue of the De Pass Collection: Objects Illustrating the Arts of Ancient Civilizations, Egyptian, Greek, Chinese, Persian and others. Cape Town: The South African Museum. Mackenzie, J. M. 2009. Museums and Empire: Natural History, Human Cultures and Colonial Identities. Manchester: Manchester University Press. Masters, S. 2018. South Africa, Greece, Rome: Classical Confrontations. Cambridge: Cambridge University Press. Rasmussen, T. and N. Spivery. 1991. Looking at Greek Vases. Cambridge: Cambridge University Press. Sparkes, B. 1996. The Red and the Black: Studies in Greek Pottery. New York: Routledge. Summers, R. F. H. 1975. A History of the South African Museum, 1825 – 1975. Cape Town: A. A. Balkema. Tietze, A. 1995. The Alfred de Pass Presentation to the South African National Gallery. Cape Town: South African National Gallery. The red-figured hydria, early 4th century B.C. Object available for view at ISHC by appointment only. The De Pass Collection: Objects Illustrating the Arts of Ancient Civilizations, South African National Gallery, Cape Town, 1934 – unknown. Living Antiquity, Sasol Art Gallery, Stellenbosch, 2005 – 2007. Containing Antiquity, Sasol Art Gallery, Stellenbosch, 2007 – 2011. Boardman, J and Pope, M. Greek vases in Cape Town guide no. 6, The South African Museum. 1961. Dugas, C. Greek Pottery. Translated from The French by W. A Thorpe Department of Ceramic Victoria and Albert Museum. A. & C Black Ltd, Soho Square, London. 1926. Gill, E.L. Catalogue of the De Pass Collection. Objects Illustrating the Arts of ancient civilizations, Egyptian, Greek, Chinese, Persian and others. The South African Museum. Cape Town. 1934. Mackenzie, J. M. Museums and Empire. Natural history, Human cultures and colonial identities. Manchester University Press, 2009. Masters, S. South Africa, Greece, Rome. Classical Confrontations. Cambridge University Press. 2018. Tietze, A. The Alfred de Pass Presentation to the South African National Gallery. South African National Gallery. 1995. Summers, R. F. H. A history of the South African Museum, 1825 – 1975. A.A Balkema, Cape Town. 1975. Sparkes, B. The Red and The Black. Studies in Greek Pottery. Routledge, New York. 1996. Rasmussen, T & Spivery, N. Looking At Greek Vases. Cambridge University Press. 1991.